Covetousness is what Ahab felt when he looked out his window and saw Naboth's garden—so lush, so well-cared-for, so close. It would make the perfect vegetable garden for him. But when he offered Naboth to exchange the garden for another, or buy it outright, Naboth turned him down. He put more value in hanging onto his inheritance than pleasing the king. This must have galled the king doubly. For not only could he not legitimately take the garden but he had been spurned by one of his subjects. Achan coveted coins and a beautiful Babylonian garment when the Israelites conquered Jericho. He took and hid them, though God had clearly said that all the Jericho spoil was to be destroyed. Achan's act led to his destruction and that of his family - Joshua 7:21-25. 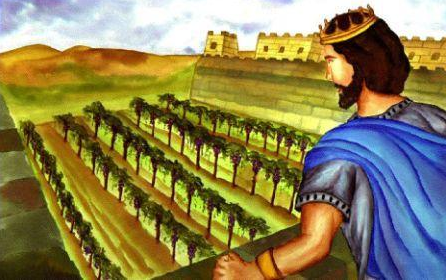 Coveting and threatening to take Israel's riches were of the threat of Syrian king Ben-Hadad - 1 Kings 20:2,3,6. Gehazi's coveting of the lovely things Naaman offered Elijah led to lying and deceitful behaviour. When found out, he was stricken with leprosy - 2 Kings 5:20-24. The Pharisees' love of money caused them to scoff at Jesus' counter-culture view of it - Luke 16:13,14. Though covetousness is wrong, who of us hasn't indulged in it from time to time? What is its antidote? "Let your conduct be without covetousness; be content with such things as you have. For He Himself has said, 'I will never leave you nor forsake you.'" Hebrews 13:5. PRAYER: Dear God, please make me aware of places where covetousness has entered my life in various areas: coveting others' physical things, success, status, security… Help me to be able to truly say, "I have learned in whatever state I am to be content" - Philippians 4:11. Amen.